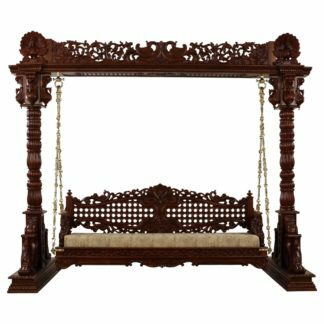 Traditionally Handcrafted Wooden Jhoola / Wooden Swing for indoors as well as outdoors with traditional design and intricate carvings.Wooden Jhoola / Swings are one of the best ways in which one can relax and be at peace. Wooden Swings provides a sense of royalty as well as elegance to the place kept. Wooden Swings can be placed inside a living room / roof-top / terrace as well as outside in the garden area. 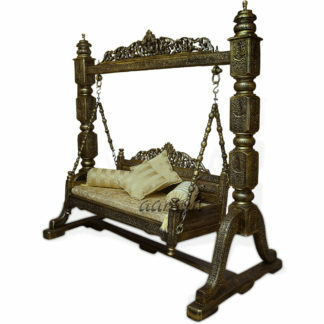 This particular Wooden Swing is made of Wood with fine polishing and finishing. 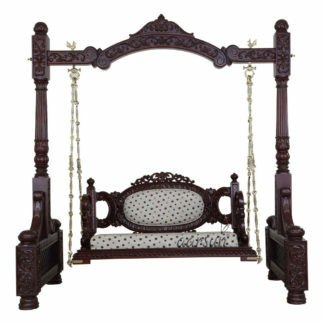 The Wooden Swing consists of 3 standard seater chair and the base with floral carvings at the back and the sides. Both the pillars of the wooden swing consists of hand-crafted leaf and floral at the base and the peak. The Pillars, the Base, the top-bar is additionally carved with bead design filling the entire surface of the Wooden Swing / Jhoola / Jhula. The Sofa Chair is attached to the top bar with a metal chain specifically made in order to withstand the weight of the chair as well as the ones sitting on it. We provide Free Shipping to all major parts of India. For details, feel free to contact us at +91-8192999135 (WhatsApp Available).